Steampunk is a sub genre of science fiction that has, pardon the pun, been gathering steam for the last decade or so. Steampunk is known for alternate histories usually set around either the Victorian British period or in the American Wild West in which steam power is the dominant power source that is used to create futuristic weapons, and vehicles like air ships. Lately books have sprung up, as have conventions, an entire subculture, and even a few movies like the Japanese anime Steamboy and The Wild, Wild West. 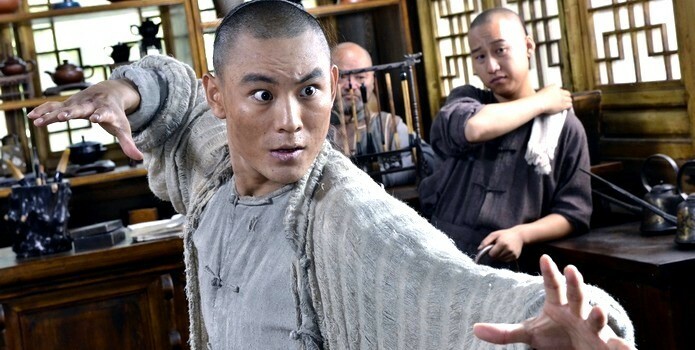 Despite this, no film has really just gone all-in with steampunk, but now fans can rejoice, as director Stephen Fung has made a kung-fu film that without a doubt is as steampunk as it gets! I’ve been extremely critical of Hong Kong films of late, finding many of them unimaginative and bland, while overseas other Asian countries are pushing the genre forward, but Tai Chi 0 is a great and thankful exception. The film has a rock n’ roll soundtrack, and the film has moments that come right out of Scott Pilgrim vs The World, like the use of text in places, giving the film a comic book feel. There is slapstick comedy, and there is even a Street Fighter 4-style K.O. moment that had me smiling, as ridiculous as it is. I’m trying to think of a film technique that Stephen Fung didn’t use, and I’m hard pressed to think of one. The story, with all the flash behind it, manages to tell a coherent and exciting story. Xiaochao is good as Lu Chan, balancing flashy kung fu fighting with youthful exuberance and handles the dramatic moments just as well. Angelababy also does a fine job as Lu Chan’s rival and potential friend Chen Yu Niang, and plays her as both sympathetic leader of her village and kung fu badass. Tony Leung Ka Fai (Bodyguards and Assassins, The Lover) plays Master Chen with a mischievous slant even in his most dramatic scenes. The best actor, in my opinion, is Eddie Peng as Fang Zijing, and he gets the biggest character arc, going from the village outsider who returns home a westernized educated man, to a man who finds a moment of happiness that is ultimately destroyed, to the greatest threat facing the village, and Peng plays every moment of his arc well, and I could sympathize with him even though his decisions turn him into the villain. The fight choreography is also well done by the legendary Sammo Hung. It is well shot, and even though there are some quick edits, they don’t take anything away from the fights, and you can follow the battles without any problems. In my opinion the best fight are the scenes where Lu Chan tries to enter the village, and different villagers step up to beat him down, with even the neighborhood kids getting in on the fun. The other scene that really jumped out to me was the fight between Master Chen and the soldiers toward the end of the film. The choreography is really well done here, with wire work that actually becomes part of the story and not a distraction. One caveat, and the one thing that drove me batty, was at the very end, where, and I admit I wasn’t aware of this, it ends with a cliffhanger followed by a trailer for Part 2 ! Tai Chi 0 is a steam-fueled roller coaster Kung Fu/Steampunk mashup that combines story, action and special effects to create a rocket-propelled piece of cinema. Bring on Part 2! Tai Chi 0 opens in North America Friday, October 19th! Next Dustin Nguyen begins production on Monk on Fire (Buddha Fire) with Roger Yuan, Jason Ninh Cao and Veronica Ngo! Sounds Great, we will see the movie.